Finally, I get to read something good about Steve Nash and my Phoenix Suns. They won over the New York Knicks that has Carmelo Anthony (although not 100%), former Sun, Amar'e Stoudemire and newly acquired Tyson Chandler. The conspiracy theorist in me says this was a gimme win because of Phoenix former ties to now Knicks Coach Mike d'Antoni. But the Knicks themselves are in dire need of wins after their underperforming start for the season. That ridiculous thought is quickly dispelled. Understandably, the Suns haven't been talked about this NBA 2011-2012 season because of a weak roster. But I am glad that they are still battling out there, ably lead by the unaging Nash. If they could just squeeze in as the 8th seed on a highly competitive Western Conference, that would be an early Christmas sports present for me. 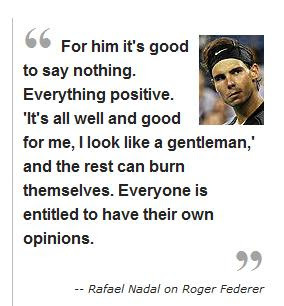 Rafael Nadal criticized Roger Federer for being mum about the tough tour schedule of the ATP and letting other players like him to speak out and burn themselves. Come on Rafa. Really now?! I believe that in the past, Federer spoke of being amenable to a reduced tour calendar. And if I remember correctly, he even agreed to re-scheduling the Australian Open to give way to longer off season. Calling out someone to join your cause is not the smartest way to go about it. Nadal can not be faulted for asking the greatest of all time to be more vocal about the schedule. Tour officials will surely take notice if Federer does. But to point out how the older Federer manages the physical demands of the tour better than other players speaks of jealousy. I researched Rafa's and Fed's results for 2011. Rafa had a 69 - 15 record while Federer had 64 - 12 last year. A difference of 8 games. 6 of those are because Rafa represented Spain in the Davis Cup. Not counting the Davis Cup & Grand Slams, Rafa entered (13) just two more tournaments than Federer (11). Tennis is an extremely strenous sport. Nadal's style of play is punishing to the body. Novak Djokovic had his share of injuries in the latter part of 2011, too. Nadal's body also broke down early in 2009 because of a hectic 2008 that includes the Olympics. But I can not remember him going this route (calling out Federer). Why? because he's winning then? A message to Rafa. It is a matter of taking care of your body and better schedule management to be consistent on tour and prolonging one's career. Also, if you want Federer to side with any of your advocacy or initiatives, calling him out in public is also "ungentlemanly". Rather it paints a picture of a sourgrape or worse a cry baby. I sure hope that Federer will be motivated by this criticism for the Australian Open. Given that Fed and Rafa are on the same bracket, it would be good to at least deny Rafa of advancing to the finals.